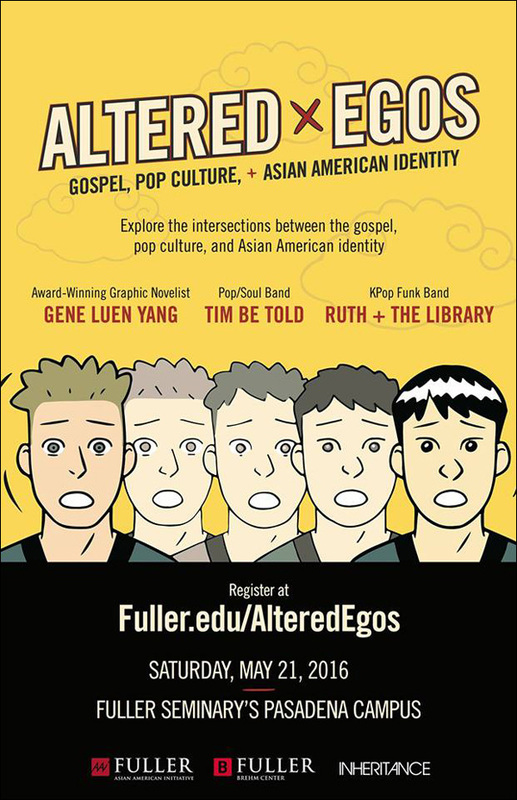 If you're in Southern California, the Asian American Initiative at Fuller Theological Seminary invites you to Altered Egos, a conference exploring the intersections between gospel, pop culture and Asian American identity with award-winning graphic novelist Gene Luen Yang. The event will also feature pop/soul band Tim Be Told and funk/pop band Ruth + The Library, as well as Jenny Yang, Margaret Yu, Jerome Mammen and myself. How does Asian American identity matter for the gospel? We invite you to explore the intersections between gospel, pop culture, and Asian American identity with the award-winning graphic novelist Gene Luen Yang, pop/soul band Tim Be Told, and Kpop funk Ruth + the Library. Registration closes at midnight on May 15. Limited walk-up registration will be available. For further information about Altered Egos, go here, and follow updates on the Facebook event. Hope to see you there.